Note: A version of this article was first published by The Weekly Standard. On the night of Apr. 6, the US opened a third air campaign in Syria, targeting Bashar al-Assad’s air force. The US has been bombing the Islamic State and select al Qaeda targets in Syria since 2014. But the Syrian regime, which is responsible for most of the civilian casualties in the country, was not hit with America’s air power until President Trump drew a new red line over Assad’s use of chemical weapons. Two days earlier, on Apr. 4, Assad’s airmen dropped a chemical agent on citizens living in the town of Khan Shaykhun, which is in the northwestern province of Idlib. Trump expressed horror the following day. “It crossed a lot of lines for me. When you kill innocent children, innocent babies, little babies, with a chemical gas that is so lethal—people were shocked to hear what gas it was—that crosses many, many lines, beyond a red line, many, many lines,” Trump said, during a press conference alongside King Abdullah II of Jordan in the Rose Garden on Apr. 5. By the following night, dozens of American cruise missiles were flying at Al Shayrat airfield in Homs province, the base from which Assad’s airmen are suspected of launching the chemical attack. Assad had to be held accountable for once again flouting civilizational norms. President Obama backed away from his red line after Assad used chemical weapons in 2013. The Obama administration pretended that it resolved the matter through its pseudo-sophisticated diplomacy. That clearly was not the case. Assad never gave up his full chemical capabilities. The limited air strikes ordered by Trump may be enough to dissuade Assad from using banned agents of mass murder once again. But Assad has other ways to kill civilians, and he has used them since the outbreak of the uprising in 2011. He could have easily killed just as many men, women, and children in Khan Shaykhun using indiscriminate, but conventional, ordinance. It is for that reason, among many, that some will once again push to remove Assad from power. The moral case against Assad is overwhelming. He is also a key ally of the Iranian regime, which is the main sponsor of Hezbollah. 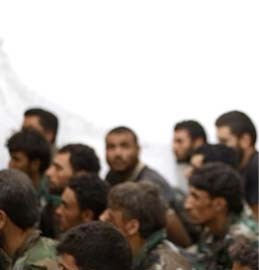 Assad has increasingly relied on Iran, Hezbollah, and Iranian-backed Shiite militias for manpower. Naturally, America’s most valuable ally in the region, Israel, sees this as a threat multiplier. Iran relies on its proxies to threaten Israeli security and its expanding footprint north of Israel’s border is a gathering storm, one that could rain down even more deadly rockets and missiles on Israel than in the past. America cannot and will not work with Bashar al-Assad. And perhaps the US should push for his removal from power, along with many of his worst minions. But when some look at Syria, all they see is Assad and Iran. They pretend that vanquishing Assad will have some sort of domino effect, necessarily leading to a more stable country. But the groups fighting him—and one another—present their own challenges. And the policy debate should reflect this simple reality. There are multiple bad actors on the ground in Syria today, including the two most dangerous Sunni jihadist groups on the planet. Conspiracy-minded commentators portray Assad as an evil genius, manipulating ISIS and al Qaeda as part of some diabolical, yet convoluted (and nonsensical) scheme to portray himself as Syria’s only reasonable ruler. Bashar Assad is evil, but he is no evil genius. He is not the wizard of Syria, using cheap parlor tricks to secretly control perceptions from behind a curtain. While Assad has certainly made use of the fact that the Syrian opposition is riddled with jihadists, this doesn’t make that observation false. It is certainly true. He has suffered significant losses at the hands of the jihadists since the beginning of the war. Consider Homs, the province where the Shayrat airfield is located. Assad’s loyalists and ISIS are at each other’s throats in Homs every day. The ancient city of Palmyra has changed hands between ISIS and the Assad regime more than once. In July 2015, ISIS staged a mass execution of more than two dozen regime fighters in front of the ruins of a Roman amphitheater. ISIS had captured Palmyra weeks earlier, advertising its use of at least one American-made BGM-71 TOW anti-tank missile during the fighting. The two sides fought around Palmyra for months. 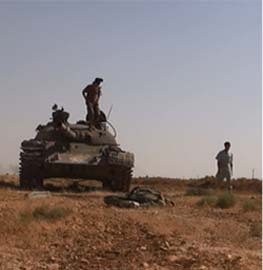 Assad’s fighters, Iranian-backed irregulars, and Russian forces recaptured it in March 2016. Then, in December 2016, ISIS overran Palmyra once again. ISIS celebrated its Russian-made spoils in one of its propaganda videos, claiming that more than 350 Syrian soldiers and Shiite militiamen were killed during the battle. Even if that figure is exaggerated, there is no question that the two sides incurred significant losses. In March 2017, Assad’s army claimed it had retaken Palmyra from ISIS for the second time in a year. In the months leading up to the regime’s surge, American warplanes destroyed a massive fleet of ISIS oil tanker trucks and also repeatedly targeted ISIS’s tanks and other military vehicles. Meanwhile, the Israelis detected a shipment of advanced weapons delivered to Hezbollah at the nearby T4 military base. Israel’s jets were scrambled to bomb arms depots a short distance from Palmyra. Therefore, America and Israel were effectively bombing opposite sides in the fight, with the US focusing on Assad’s Sunni jihadist enemies and Israel striking Assad’s Shiite jihadist boosters. By itself, Palmyra has limited strategic value. But the city is nestled in an oil- and gas-rich region, where the Assad regime built a number of facilities to supply power to residential areas. ISIS has contested the Assad regime for control of these natural resources for years. Assad’s oil deals with ISIS have been a lucrative source of revenue for the so-called caliphate, but this isn’t part of some grand plan by Assad to prop up Abu Bakr al Baghdadi’s enterprise. He would surely rather control these gas and oil installations outright, instead of succumbing to ISIS’s extortion. In January, for example, ISIS released a video of its fighters planting and then detonating explosives around the base of Hayyan gas company, which is part of the Shaer gas field in Homs. The message to Assad was clear: Pay up, or the jihadists will cripple your ability to provide heat. ISIS regularly releases propaganda from the fighting at gas and oil fields in Homs, as well as from the T4 airbase. Other videos and images document the ongoing conflict in Deir Ezzor, an eastern city in Syria, as well as in the northern Aleppo province. Just this past week, ISIS produced images from each of those frontlines. And ISIS has the ability to strike the Assad regime elsewhere, too, such as in Damascus, Latakia and other areas. Independent reporting confirms the ongoing war between the two on these fronts. ISIS isn’t the only jihadist foe plaguing Assad’s men. 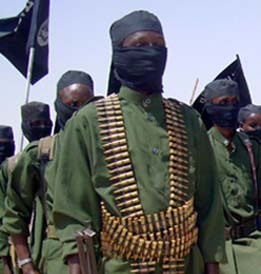 Al Qaeda is often underestimated. 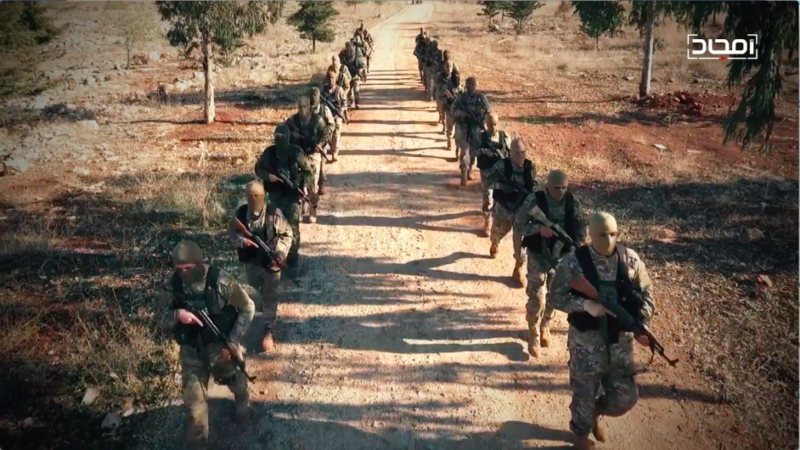 Despite many setbacks in Syria, including the rise of ISIS, al Qaeda has gained ground. The group long sought to mask its hand in the insurgency and build broader support for its jihadist cause. In spite of many unforeseen events, such as Abu Bakr al Baghdadi’s attempt to dominate the jihad, al Qaeda succeeded in building its largest guerrilla force in history. In June of last year, Brett McGurk, the Special Presidential Envoy for the Global Coalition to Counter ISIL, told the Senate Foreign Relations Committee that Al Nusrah Front “is now al Qaeda[‘s] largest formal affiliate in history” and has “direct ties to Ayman al Zawahiri, Osama Bin Laden’s successor.” Some US officials estimated that Nusrah’s ranks swelled to 10,000 or more fighters. It was a Nusrah-led coalition that swept through the province of Idlib in early 2015 to give the insurgents their largest base of operations to this day. 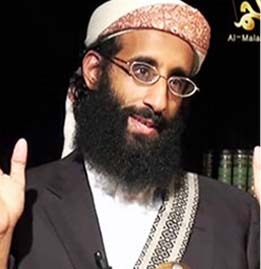 Al Qaeda’s leaders and allies hope to build an Islamic emirate in Idlib. They face many obstacles, but that is their goal. Most of the America’s air strikes against al Qaeda in Syria, under both the Obama and Trump administrations, have targeted the group in Idlib province. In July 2016, Nusrah changed its name to Jabhat Fath al-Sham (JFS) and its leader claimed to have disassociated from al Qaeda, thereby sowing confusion around the globe. (There are many reasons to doubt this was a sincere move.) Then, in January, JFS merged with four other groups to become Hayat Tahrir al Sham (HTS), or the “Assembly for the Liberation of Syria.” The head of HTS has spoken of the necessity of waging a “popular jihad.” Assad’s war crimes have undoubtedly made this easier, as more hearts and minds gravitate to the jihadists’ cause with each atrocity. 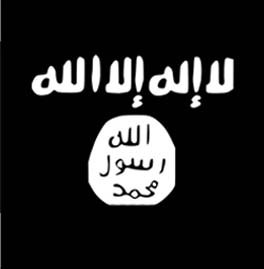 But the truth is that the jihad is already disturbingly popular in Syria, with only pockets of significant resistance. HTS is either leading or playing a prominent role in several current battles against the Assad regime. In February, HTS launched a complex raid against Assad’s military-intelligence service in the city of Homs, just 20 miles or so from Al Shayrat airfield. Using its elite “inghimasi” fighters, who are trained to immerse themselves in battle before possibly blowing themselves up, HTS stormed into a heavily guarded complex and killed Assad’s top intelligence official for the entire province of Homs. This was a professional hit that only highly-trained jihadists could carry out. HTS has spearheaded other recent assaults as well. In February, HTS and other groups pushed into the regime’s strongholds in the southern city of Daraa. HTS suicide bombers drove vehicle-borne improvised explosive devices (VBIEDs) into key regime-controlled locations early on in the battle. HTS “martyrs” struck Shiite holy sites in the city of Damascus on March 11, and then on Mar. 19, HTS and its allies surprised the Assad regime with an offensive on the outskirts of the city. Its suicide bombers led the way. Two days after that battle began in Damascus, HTS initiated another offensive in the northern part of Hama province, raiding more than one dozen towns and villages. This past week, HTS has joined others in an assault on regime positions in the coastal province of Latakia, a longtime stronghold for the Assad family. In each case, other rebel organizations are participating in the fighting, either in parallel to HTS or as part of a common military operations room. Some of these rebel groups operate under the Free Syrian Army (FSA) brand, but the FSA is a collection of loosely affiliated insurgents at this point and has no uniform, nationwide chain-of-command. Other insurgents fight under Islamist banners that make them ideologically closer to HTS than to the West. There is simply no good reason to think that HTS can be easily cleaved from the rest of the opposition, which is fractious and (with few exceptions) has repeatedly refused to abandon the jihadists in HTS, even when they made their allegiance to al Qaeda well-known. Bashar al-Assad is a mass murderer and a war criminal. He is no friend of the West, and his actions helped till the ground for the rise of Sunni jihadism in Syria. But there is more to this war than just Assad. And the policy debate must reflect on-the-ground realities. Excellent, objective analysis, Tom. We need more like it. What do you think of the possibility that Assad’s plane hit a rebel arms depot? The initial report from Reuters said that a rebel warehouse had been the target of the bombing run, then I saw a greenish yellow-cloud (def. not Sarin) in White Helmet footage and the casualties looked like the suffered from a mix of breathing (chlorine, phosgene?) and neuro distress. This does not look like a MilSpec binary Sarin gas attack. Looks like rebel homemade witches’ brew from the looks of the dead and wounded. Touching a Sarin crater wearing sandals? Only in the ME. Rebels have used chem weapons ten times as much as the regime has. Stay skeptical! I see a genocide in Syria. The only policy that should be discussed first is ending that genocide otherwise the international order that was put in place after our victory in WWII no longer stands and nor do we. George Bush is a mass-murderer, torturer and war criminal. Barack Obama is a mass-murderer, jihadi supporter and war criminal. Donald J. Trump is a mini-murderer (so far) and a tool of his generals. What’s not to like? Bombs away!! PS Lavrov is about to tell the JV what to do with its bombs. Brilliant piece. I hope the Trump admin is reading every single piece on LWJ and is commissioning more. Seb Gorka is. One slight disagreement: I believe the Muslim Brotherhood is the most dangerous islamic organisation on the planet. They were making Obama’s policy for eight years after all. First, you want to read up on the evidence. Scott Ritter’s piece at Huffington Post is comprehensive. The bombs were dropped up wind of the killings, but fact is that the bombs wrecked a manufacturing site. Ritter notes this site is similar to two other sites from Aleppo that had produced chemical weapons. Between pro-DAESH Liwa al-Aqsa and Al Qaeda calling itself Al Nusra Front or Tahrir al-Sham there have been any number of chemical weapon operations in Syria and northern Iraq. “Useful Fool” is also used in Ritter’s narrative. Where we have Americans going in the tank for DAESH or Al Qaeda, that’s about the least you want to say. I find your/Ritter’s explanation plausible, which is why I made my comment above. Rebels w chem weapons are a much greater threat to the West than Assad w chem weapons, and the rebels use them more often. Sarin is very nasty stuff, and if the rebels have it we need only to recall the French government distributing atropine to know why it is critical to understand who owned the agent that killed those poor people (were they even Khan Sheikoun residents?). I’ve said it before and I’ll say it again. The Sunni Jihadists are more of a threat to the west because of the much larger global Sunni diaspora, and the accompanying global Jihad movement (and stealth migration Jihad). The US, NATO and Russia should be more concerned about this than Iran and Hezbollah, who are fixated on Israel and regional Middle East dominance. Israel should be able to defend itself (they have generous US subsidies to do so) until the Sunni Jihadist proto-Caliphates and Emirates are destroyed in Syria and Iraq. After that, perhaps help can be given to solve the Hezbollah issue in Lebanon. 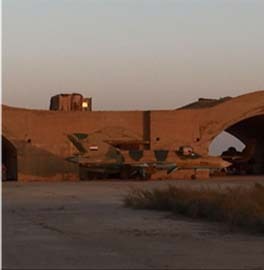 It seems clear that an Iranian/Hezbollah assault on Israel from Lebanon, or even Syria will not enjoy Russian air support, the main component in their present battlefield success. Conflating Israel’s concerns about Hezbollah into a necessary element of solving the Syria crisis is distracting from selecting and maintaining what should be the principle objective, the defeat of ISIS and AQ affiliates in Syria and Iraq. I just could not agree more. As Mad Dog & Co. charge off now after Assad and the Iranians, ignoring our old friend Zawahiri and giving Baghdadi’s people more room, we risk repeating precisely the same mistake we made in 2002-03, taking our eyes of Bin Laden and the Taliban and charging off after Saddam. We can’t pick our battles, it seems. Or realize that our enemies are Sunni Jihadists, inspired and backed by our friends in Saudi Arabia (who we rush to give medals to), not the Iranians and their proxies, who generally fight within their lanes and actually make a difference when they intervene to support allies. Where is the evidence that Assad was responsible for the latest chemical attacks on civilians in Idlib, or that he was responsible for the first?